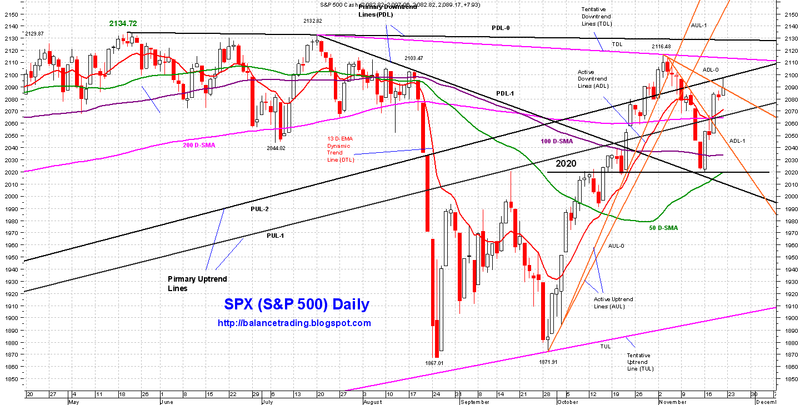 SPX rallied nearly 4% last week, but everyday breadth indicators deteriorated. Unless and until at least three of five major indices (DJI, DJT, NAZ, RUT and SPX) take out their all time highs, chances are high that the rally since late September lows is nothing but a counterrend rally. A daily close above AUL-1 would signal that the sell off is over and SPX is on its way higher to new highs. A daily close this week below 2020 for SPX would signal a high likelihood of a test of 2000 level. A daily close below 2000 would signal more selling ahead to test September and August lows. I am in cash now and planning to start opening long positions should SPX take out its all time high (2134.72) or opening short positions should SPX close below 2000.